What you miss in any account of Koya-san’s more famous large-scale temple structures is a proper sense of the intricate symbolic repleteness embedded in every possible corner of the city environs. There is no place in Koya-san that is not marked by its religious history and its continuing role as a living center of Buddhist practice. 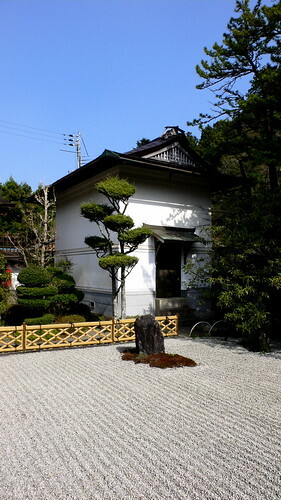 Unlike Kyoto, or even Nara, where the transition between temple grounds and urban space is clear, at Koya-san there is no particular ‘outside’ that is readily identifiable as secular space. Even the tourist stores and restaurants are entangled localities within the constellation of Koya-san’s 117 functioning temples, which are themselves shepherded together in space by the press of the surrounding cedar forests. 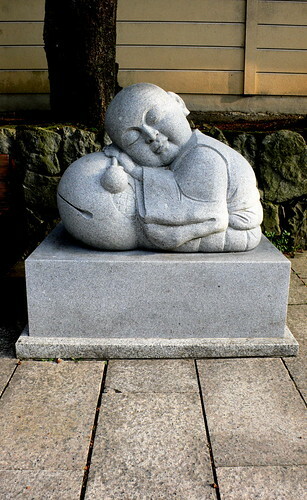 These sleeping monk statues sit quietly near the bus stop at Reihokan-mae. 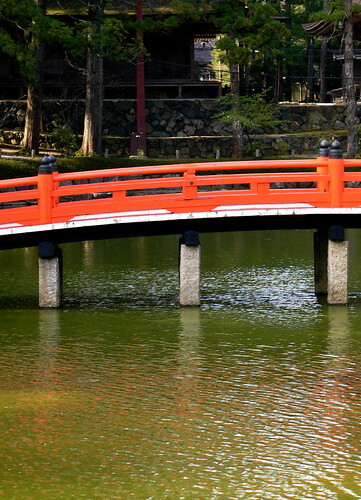 This bridge leads to Bentensha Shrine, a small shrine located on a cedar-covered island in Hasu-ike pond. 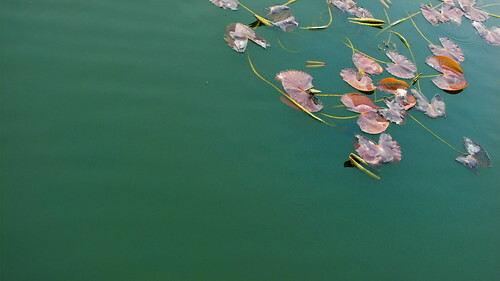 At Daishi Kyokai, a large hall for followers of Kobo Daishi who are studying to become missionaries, there is a similar shrine, this one located in a lotus pond at the end of a thin, persimmon-colored bridge. Bentensha Shrine was closed to visitors, but this one was open, so Jess and I made our way across the thin bridge, out into the lotus pond, and rang the shrine bell to summon the deity. 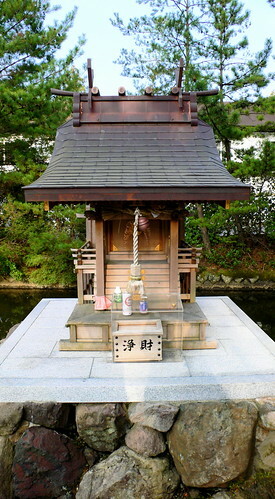 The small wood and copper shrine at Daishi Kyokai. While looking for the Reihoken Museum, Jess and I inadvertently ended up walking around the empty grounds of this temple complex. We entered the main hall and quickly realized that it was a shukubo, a temple that provides lodging for visitors. We could see the kitchen, and some communal bathrooms as well, though of course the building was empty because it was afternoon and everyone was away visiting other, more famous, temple areas. Jess and I sat on the veranda for a while, resting and taking in the sand garden while enjoying the kind of quietness that only comes when no one else is around. 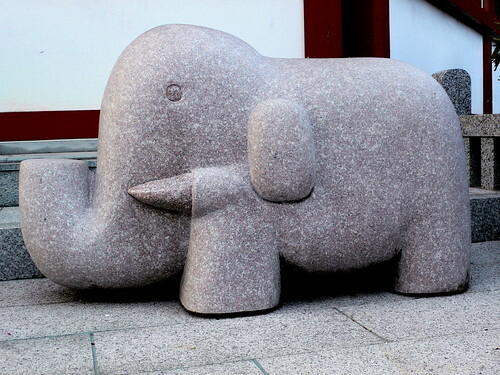 I’m not sure what the significance of this elephant statue is, but I know what I like. This white dragon figure was sitting outside of one of the smaller temples that Jess and I were forced to pass in a hurry since dusk was beginning to fall and we wanted to make sure that we had time to see the Okunoin grounds. 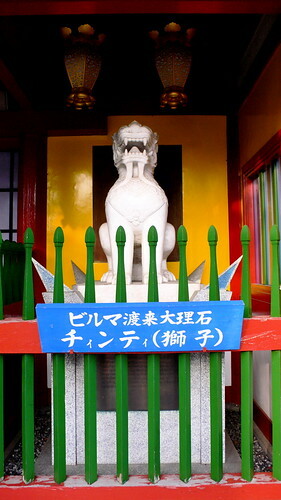 The dragon temple could have been Hongakuin, Daienin, Jofukuin, Sanboin, Henjokoin, Jizoin, Sekishoin, or Shojoshinin — all of which we passed on our walk to Okunoin. Observe his nearly temple-like construction.